As a local plumber in Selsey and Chichester, Sal has built his business on customer recommendation and the excellent reputation he has earned. With Fontana Plumbing & Heating, you're assured high quality workmanship and excellent customer service - all at a reasonable price. 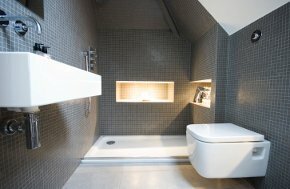 Chichester - New floor tiling and new bath panel in bathroom. Fitting supplied water filter in kitchen. Company visited site and discussed work and timetable. This was followed up by a series of emails to clarify outstanding issues on content, materials, etc, and to accept quotation. Company started work on day and time as promised and caused minimal disruption to normal use of the house. Workmen were very polite and trustworthy so left alone while wife and I went shopping. The finished work was to a high standard and there were no subsequent problems. Strongly recommend Company for similar work. Price was reasonable. 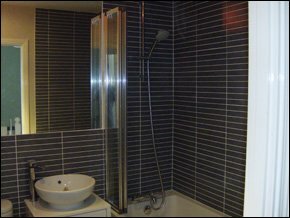 Selsey - Replacement of shower unit. Sal carried out the work in a professional manner, was on time, cleaned the area on completion, price quoted was the priced charged. I would recommend Fontana plumbing and I will be using them again. Amazing service from this company as he was the recipient of a phone call from a random frantic lone woman with burst water pipes! Immediate friendly service and work done very promptly. Thank you. Chichester - Central Heating System Overhauled due to possible leak. Flushed down heating system. Replaced bathroom ladder towel rail. Replaced bedroom radiator valve. Resealed kitchen TRV. Added inhibitor and refilled system. Bled system and final check. Satisfied all OK. Left site in tidy and clean condition. Cost as agreed. Arrived on time and date agreed. HIGHLY RECOMMENDED.